National signing day is over. But the recruiting conversation — like the snow in Seattle — never ends. And Washington fans, in particular, have plenty still to discuss. Chris Petersen reeled in perhaps his most complete class at UW, signing 23 2019 prospects (and 15 four-star recruits, according to 247Sports). That class ranks 11th nationally, one spot behind rival Oregon, and second in the Pac-12 Conference. But which future Huskies are primed for early playing time? Who’s the biggest sleeper? The biggest get? The player with the most to prove? While we wait for the start of spring ball (and hopefully, a lot less snow), let’s take a look at some signing day superlatives. Biggest get: WR Puka Nacua — 6-2, 196 — Orem (Utah) High. The four-star Orem, Utah, wide receiver would also be in line for “latest get,” if that were another category. Nacua waited nearly a week after national signing day to send his letter of intent, and he showed up 45 minutes late to the television studio where he agreed to announce his decision when Salt Lake City got buried in a further drama-building blizzard. And guess what? It doesn’t matter. Nacua is worth the wait. That’s because the 6-foot-2, 196-pound receiver is also the Utah state record-holder for career receptions (260), receiving yards (5,226) and receiving touchdowns (58), as well as single-season catches (103), receiving yards (2,336) and receiving scores (26). His 2,336 receiving yards were also the most in the country in 2018. Nacua is the reigning Polynesian Bowl Offensive MVP, MaxPreps.com and USA Today first-team All-American and the 2018 Utah Gatorade Player of the Year. When he enrolls at UW this summer, none of that will matter. Still, the Huskies have a glaring need at his position, with three returning starters at wide receiver but a crippling absence of consistent production. Nacua may be the answer. Now, all he has to do is climb the depth chart and properly acquaint himself with Jacob Eason. Biggest sleeper: LB Drew Fowler — 6-2, 210 — Bellevue High. Hard to find a bigger sleeper than a walk-on. Granted, Fowler — a 6-foot-2, 210-pound linebacker from Bellevue — was offered scholarships by UCLA, Utah and Oregon State, so there’s little question whether he belongs in the Pac-12 Conference. 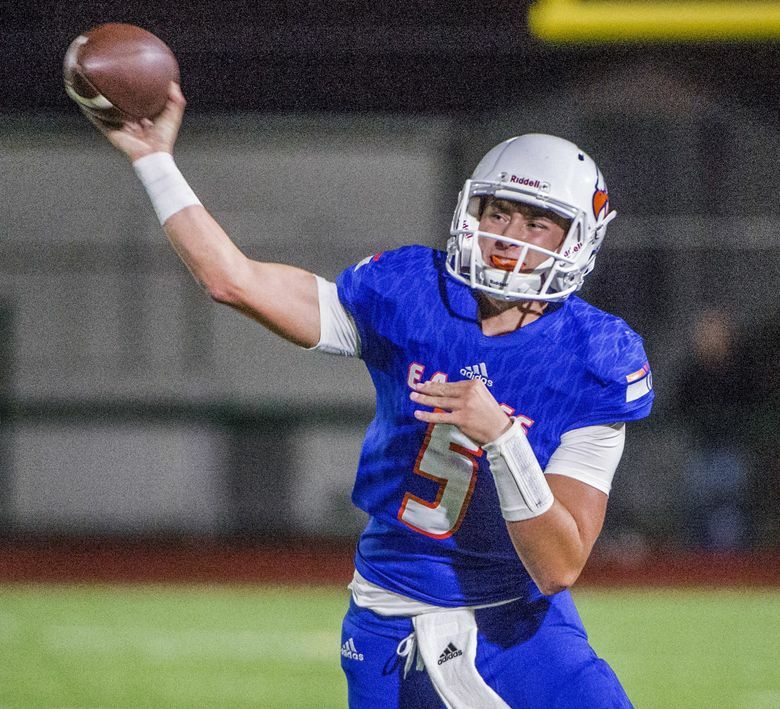 He was also named the KingCo 2A/3A Defensive Player of the Year in his senior season. In the wake of Ben Burr-Kirven and Tevis Bartlett’s departures, Washington needs to plug a sudden hole on the second level of its defense. Fowler may not be ready to do that just yet, especially while competing with four-star signees Josh Calvert and Daniel Heimuli. But the former Bellevue linebacker and running back is stout enough to stop the run and has the wheels to cover in space. He’s also plenty motivated to prove that he belongs. This may be a multi-year project, but expect Fowler to make an impact (on special teams, at the very least). Most immediate impact: LB Josh Calvert — 6-1, 227 — Oak Park (Calif.) Oaks Christian. The answer here should really be placekicker Tim Horn. But where’s the fun in that? As previously noted, Burr-Kirven and Bartlett are out. D.J. Beavers’ future is also clouded after the senior suffered what looked like a significant lower leg injury in the Rose Bowl. Rising senior Brandon Wellington returns, but there’s room on the inside for a freshman to make an impact. Calvert gets the edge over Heimuli here, primarily because the former enrolled early and thus will get an entire semester’s head start in the weight room and on the practice field. A high school quarterback and linebacker, Calvert is finally focused entirely on defense. Now we’ll see how quickly he can find the field. Best Drama: S Asa Turner — 6-2, 199 — Carlsbad (Calif.) High. Twenty players signed with Washington during the NCAA’s early signing period in December. The problem? The Huskies had 21 verbal commits. Turner — a 6-2, 199-pound athlete from Carlsbad, Calif. — delayed his decision while he continued to consider both Washington and Notre Dame. This also doubled as a positional dilemma, with the Irish envisioning Turner as a hybrid linebacker and UW slotting him as a safety. Ultimately, Turner stuck with the program he made a verbal commitment to in July, signing with Washington (and choosing the safety position in the process). He’s ranked as a four-star athlete and the No. 198 overall prospect in the 2019 class by 247Sports. Chris Petersen and Co. endured the drama, and eventually Turner settled on Seattle for a second time. Most to prove: LB Alphonzo Tuputala — 6-2, 249 — Federal Way High. Technically, Tuputala is the lowest-rated Washington signee (besides Tim Horn, and placekickers by default are not ranked as highly) via 247Sports. The local linebacker received just one Power Five offer, from UW. Of the Huskies’ four traditional linebacker signees, Tuputala was probably talked about the least. And yet, this wasn’t some throw-away offer to an in-state product and inevitable special teamer. Tuputala was named an Associated Press 4A all-state first-team linebacker following his senior season in 2018. He was one of the Huskies’ most impressive representatives at the Polynesian Bowl in January, tying fellow UW signees Daniel Heimuli and Laiatu Latu with six tackles to lead their team. It’s natural to envision sizzling freshman seasons for touted four-star prospects Calvert and Heimuli. But Tuputala too infrequently enters the conversation. Maybe he’ll change that this fall. The Wait-and-See Award: QB Dylan Morris — 6-0, 188 — Puyallup Graham-Kapowsin. This one goes out to the player most likely to shine following an inevitable redshirt season. And, although Chris Petersen would paint a different picture, there will not be a legitimate quarterback competition this spring and summer. Jacob Eason will be your starter. That means Morris — and redshirt sophomore Jake Haener, and redshirt freshmen Jacob Sirmon and Colson Yankoff — will have to wait. It also means Morris will get to learn under Eason, a player he idolized during the early stages of his Washington prep high school career. If all goes to plan, Eason will bolt to the NFL following the 2019 season and a hotly contested quarterback battle will commence. Then we’ll all see what Morris is really made of. But not quite yet. Strongest position group: Defensive tackle. Washington’s four defensive tackle signees — Jacob Bandes, Faatui Tuitele, Sama Paama and Noa Ngalu — weigh a combined 1,235 pounds. If you’re keeping track at home, that’s nearly seven Myles Bryants. They have a combined 15 recruiting stars between them. When we said “strongest position group,” we didn’t mean literally, but that would also be true. The point is, defensive line coach Ikaika Malloe needed desperately to fill the massive void left by Greg Gaines, Shane Bowman and Jaylen Johnson. He accomplished that feat with this formidable foursome. The UW freshmen defensive tackles will have to leapfrog redshirt freshmen Tuli Letuligasenoa and Sam Taimani to find the field this fall. But any way you slice it, the future looks bright on the interior of the Husky defensive line. Weakest position group: Tight end. OK, so this is kind of a cop-out. Tight end was the only position, besides punter and long-snapper, where Washington did not sign a single player in 2019. That shouldn’t come as too much of a concern, considering that dynamic junior Hunter Bryant and steady sophomore Cade Otton will both be back this fall. The Huskies will almost certainly sign multiple tight ends in 2020, the most likely being Newport Beach, Calif., three-star prospect Mark Redman. On the whole, though, Washington addressed the vast majority of its needs in the 2019 class. Now it’s time to see if these highly touted Huskies can produce to their potential. Make your own picks in the Twitter polls below. The Wait-And-See-Award (most likely to shine following a redshirt season)?